It's occurred to me that there are probably people who aren't familiar with the Romanovs and since I recently saw Anastasia on Broadway, read a novel a few months ago which was an alternate history of the Romanovs, and yes, the FrankenIdea has a Romanov-related strand in it, I may as well blog about 'em. 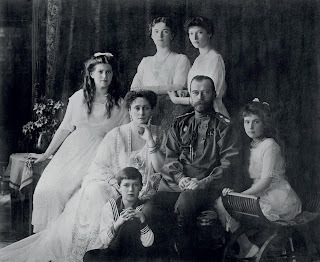 The Romanov dynasty ruled Russia from 1613 until 1917. The dynasty had famous rulers like Peter The Great, Catherine the Great (who actually married into the family) (and her son may not have been the biological son of her husband, so the descendants may not have been bloodline Romanovs, but her husband wasn't a male line Romanov anyway, so...), Alexander II (Nicholas II's grandfather, who freed the serfs and was bombed to death) and other tsars. Tsar, by the way, is derived from Caesar. Means emperor. Because that's what they were, Emperor of all the Russias. The Anastasia animated film came out when I was a kid and I remember liking it, but as I found out about the actual history of the family, I became seriously intrigued. I mean, how can you not? The Romanovs were easily the most powerful monarchs in Europe--the tsar was an autocrat. Basically, they were dictators. The tsar was all-powerful. The Romanovs were incredibly wealthy. And their downfall was so dramatic. Of course, the reasons for their downfall are manifold and the circumstances and forces that led to Nicholas II abdicating in 1917 had been building for decades--and there have been a million books written about them. Reasons like poverty, one all-powerful man ruling a huge landmass like Russia, war, famine, and the out-of-touch aristocracy predate Nicholas. He didn't do anything to solve any of those problems, btw. Nicholas II was, by many accounts, a very good family man--terrible tsar, nice guy at home. He married Alix of Hesse, a granddaughter of Queen Victoria, for love. Nicholas became tsar sort of suddenly, without his father having trained him to rule, and Nicholas did not want to be tsar. But he didn't have a choice. Alix--she changed her name to Alexandra and took the patronymic Feodorovna when she converted to the Russian Orthodox Church--was a shy, very religious young woman and she didn't fit in with the Russian court. As the years went on, Alexandra associated less and less with the aristocrats. She claimed illness. She liked a quieter life. People accused her of being plain, without personality, that she spoke bad Russian and French, that she was too German--and that she was too English--and too religious. What they didn't know was that Alexandra was worried about her sick son. Nicholas and Alexandra had four daughters: the Grand Duchesses Olga, Tatiana, Maria, and Anastasia. But they needed a boy because the Russian throne could only be inherited by males, according to the Romanov family house laws. As she gave birth to more girls, Alexandra's health deteriorated--and she began turning to mystics, going on religious pilgrimages, and more to ensure that the next baby would be the son and heir. 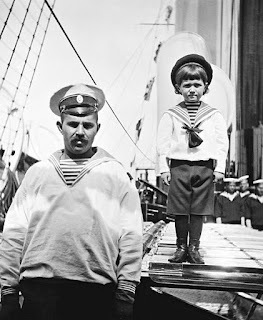 In 1904, Tsarevich Alexei Nikolaevich was born. Unfortunately, he was born with hemophilia: his blood didn't clot, so any bruise, cut, or fall could lead to internal bleeding or bleeding out, which could kill him. He inherited the hemophilia genes from Alexandra--hemophilia had turned up in Queen Victoria's youngest son and several of her daughters were carriers, passing the disease onto their sons and passing the faulty gene onto their daughters. The family chose to keep Alexei's disease a secret from the general public. As he grew up, they assigned sailors from the Russian navy to act as male nannies, who often carried Alexei around whenever he couldn't walk, even when he was past the age to be carried around. They hired on doctors to care for their son, since there wasn't a ton anyone could do for hemophiliacs at the time. And Alexandra increasingly came to rely on Rasputin, a sketchy mystic monk who seemed to be able to at least calm Alexei down when he was injured or ill.
She grew convinced that Rasputin was vital to her son's life and therefore, to the dynasty and Russia. But as his influence over the imperial couple grew--and as relatives and others kept hinting to them, hey, maybe the optics of having this scandalous kook in your midst isn't the best idea, guys. 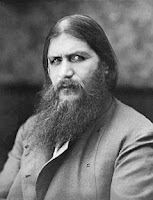 Why do you keep him in your circle?--rumors spread that Rasputin had seduced the empress, that he'd maybe even been inappropriate with the daughters. When WWI started--and Russia entered the war on the Allied side, with Britain and France--the Russian army lost an incredible number of soldiers. Cannon fodder. All of the factors that rumbled in Russia pre-war were only magnified during the war. Then Nicholas had the bright idea to personally take over the command of the Russian army in 1915, even though his cousin Grand Duke Nicholas Nikolaevich had been commanding. Removing his cousin wasn't a popular move and as the army kept losing, the tsar was blamed for the army's horrible loss of life. And while Nicholas was away commanding the army, he left Alexandra in charge of the governing of the empire. Which, like, would've been fine had Alexandra not hated so many of Nicholas's ministers and had she not trusted Rasputin so much. Stay tuned for Part Two of the Romanov saga. Also, I want to live in The Winter Palace...or at least something named The Winter Palace. It's a very pretty looking palace. The Romanov history is definitely interesting. 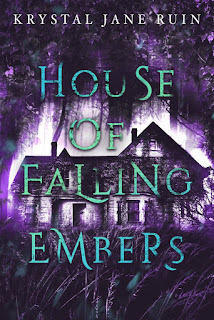 I've read several books with extremely different spin-offs and enjoyed them each time. They're just incredible fodder for stories because the history is so dramatic, tragic, and there are some really clear turning points and "what if?" moments there.